Swansea City have signed goalkeeper Lukasz Fabianski from Arsenal. The 29-year-old Poland international will join the Swans on a free transfer when his contract with the Gunners expires at the end of June. Fabianski's last game for Arsenal will prove to be the FA Cup win over Hull City, bringing a seven-year spell with the club to an end. "The main reason I came to Swansea was because I want to be the number one goalkeeper," he said. Fabianski's arrival at the Liberty Stadium will increase speculation over the future of first-choice keeper Michel Vorm. Vorm, 30, has been Swansea's first-choice keeper since joining in 2011, but has been heavily linked with a move to Liverpool. Reds manager Brendan Rodgers brought the Dutchman to the Liberty Stadium from FC Utrecht and is looking for a goalkeeper to provide back-up for Simon Mignolet. Swansea insist Liverpool have not been in touch over Vorm, who has two years to run on his contract, but Fabianski's arrival could alter the situation significantly. Ex-Swansea goalkeeper Roger Freestone is among those who believe Vorm could move on in the off-season. "I don't think he's [Fabianski] going to come to Swansea to be a reserve team goalkeeper. "It throws a few question marks for Vorm, but if they can get £5m or £6m for him, it'll be sound business," said Freestone. Liberty Stadium boss Garry Monk told the club's website: "He's [Fabianski] come from a big club where it has been difficult for him to command the number one spot. "It's been frustrating for him at Arsenal because he hasn't played as many games as he would have liked. "But speaking to him this week I could see the hunger he has to come here and prove he is a number one goalkeeper. "That's a great attitude to have and it's the only type of player I want at Swansea City." Despite playing in the FA Cup final, Fabianski had played second fiddle to fellow Pole Wojciech Szczesny, five years his junior, for the past three seasons. In February, Arsenal manager Arsene Wegner said it was likely Fabianski would leave at the end of the season in search of more regular appearances after rejecting an offer of an extended contract. Fabianski, who joined Arsenal from Legia Warsaw in 2007, made only one Premier League appearance in the Premier League this season - the last league game of the season against Norwich City. His other 13 appearances came in cup competitions, playing a starring role in the FA Cup semi-final against Wigan Athletic by saving two spot-kicks in the penalty shoot-out. 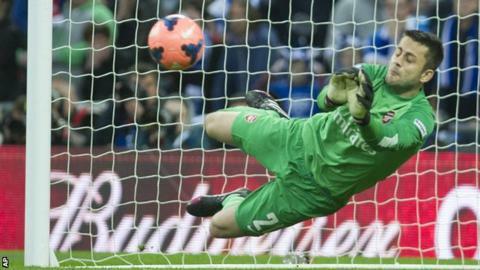 He also saved a penalty in the 1-1 draw with Bayern Munich in March as Arsenal bowed out of the Champions League in the last 16. "I want to play week-in, week-out. It's going to be a real fight, but I'm not afraid of that," said. "Competition is always good, so I think everyone will take positives from that. "I'm excited. I've already asked for the pre-season programme to see how it looks. "I'm really looking forward to starting with my new team-mates and I think it's going to be a fantastic new chapter in my life. "I will be working hard for the club, giving everything every single day."